A few years ago (almost to the day) I wrote an entry on waxing bottles at home using crayons and hot glue sticks. Since then I’ve received some very nice emails thanking me for the advice and pics of some beautiful bottles you guys have done at home. Since January when we released the first bottles of Embrace The Funk some of you have messaged me asking about the wax on Deux Rouges and what process we use. After speaking with some other breweries on their process we found this to work really well for us. First we buy our waxes from a company called Blended Waxes Inc. They sell a true bottle sealing wax that many other breweries like Fifty Fifty (who gave us some great insight) use on their bottles. They do sell one pound blocks which homebrewers can buy, it might be a little expensive to ship just one or 2 so maybe ask your LHBS or do a group brew club buy. Depending on how far down the neck your go will determine how many pounds you need, but we get about 35-40 bottles off each pound of wax. So now that we have the wax we need to melt it. We use a 2 prong approach to melting and dipping. We have one device to melt the wax in and another that we actually dip bottles in. To melt the wax we use a Presto Granpappy deep fryer and to dip the bottles in we use a Presto Frydaddy deep fryer. So why 2 different pieces of equipment? The Granpappy fryer gets a little hotter than the Frydaddy so we can quickly melt the wax bars. It also has a bigger tub so we can constantly keep wax melted to transfer over to the smaller Frydaddy. 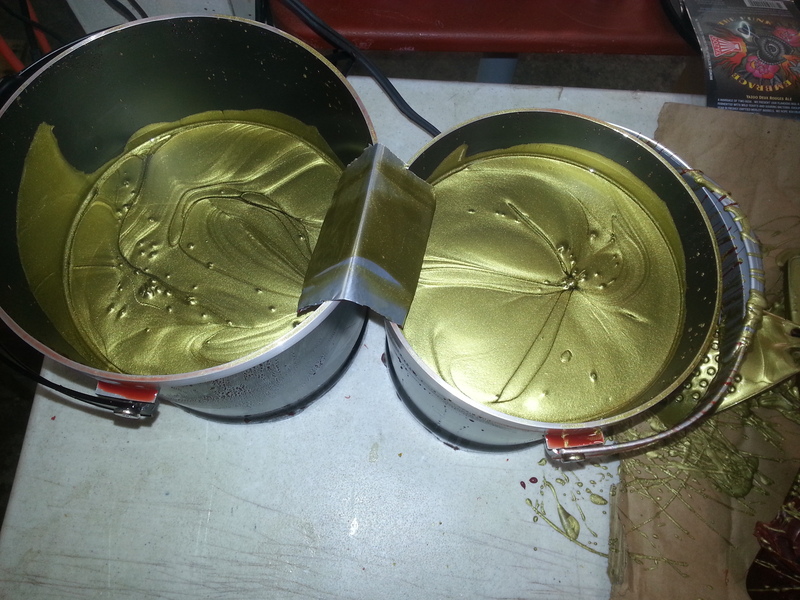 I usually keep 3 pounds melted in the Granpappy, nobody wants to stand around waiting for more wax to melt! One bar takes about 15 minutes to melt once you have it going. The initial melt time will depend on the temp of the wax, but I’ve found that when we are setting up it takes about 25 minutes to melt the first 5 lbs. Now the dipping part! I use a ladle to transfer the wax from the Granpappy into the Frydaddy. Notice the metal “bridge” between the 2 containers, that will save you some clean up down the road. It’s just a Coke can I cut open and bent to form a bridge so the wax drips back into the fryers. One thing to remember is if you take a break you will need to sir the wax back up. There many different ways to dip and create certain effects on the bottles with no drips, single drip, multiple drips, short drip etc. But they all begin with the first dip which in our case using this setup is very quick. No more than the minimum time needed to dip the neck in and out, about 1 second. So what’s the reason? 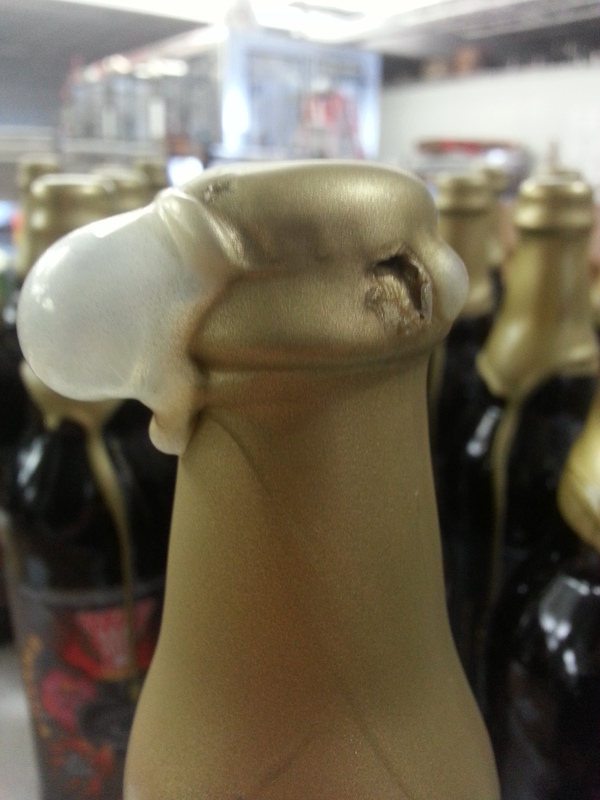 If the bottle is in the fryer with the wax too long it will melt the seal under the cap and compromise the seal. If it does you will know it, the escaping co2 will bubble out the wax. I’ve been fairly lucky so far, only screwing up one bottle by dipping too long. See the pic to the left side. So once you’ve dipped and quickly removed the bottle from the fryer it’s time to create the wax effect. Holding it over the fryer and letting it drip back in will make clean edge all the way around. Setting it down as soon as you let a little drip back in with produce multiple drips. The one I went with on this batch was a single long drip. Which is fairly easy to do. Let a little wax drip back in (which allows part of it cool on the bottle) then hold the bottle upright, but at a slight angle, the wax should pull to one point and drip. Where I usually wax our bottles is near a drain, which has a slight slope. 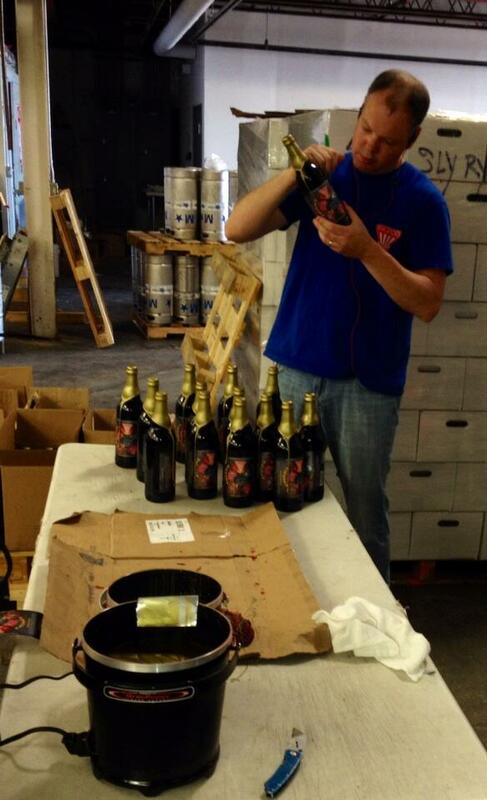 I can set the bottles down on the table and the wax will continue to drip. A fan nearby is a good idea for a couple of reasons. While the wax we use doesn’t stink or smell bad, there is a bit of an odor and if you are in an enclosed area it might be bothersome. Also a fan can speed up the drying process, it’ll take 3-5 minutes for each bottle’s wax to setup and harden to a point where it can be boxed up. When I’m done waxing I unplug the fryers and let the waxes completely cool down to harden back up. That takes a few hours. I’ll then turn them back on for 2-3 minutes and the wax slides right out as a wax “wheel”. The rest should wipe right out with an old cloth. I plan to blend some of the leftover waxes together whenever I need to for some smaller batch size releases. That’s pretty much our process, simple but it works when you have a good workflow. Alright, I am pumped about this! Funk Fest is back on May 4th! Tickets for our second annual event went on sale earlier this week and it’s getting close to selling out. Last year we had close to 40 sour and wild beers for people to sample. This year we will out do ourselves. Tickets are limited to 200 people as to keep the festival relaxing and enjoyable while providing a lot of great beer. The bottles I waxed today and showed in the post are the single barrel un-blended version of Deux Rouges. 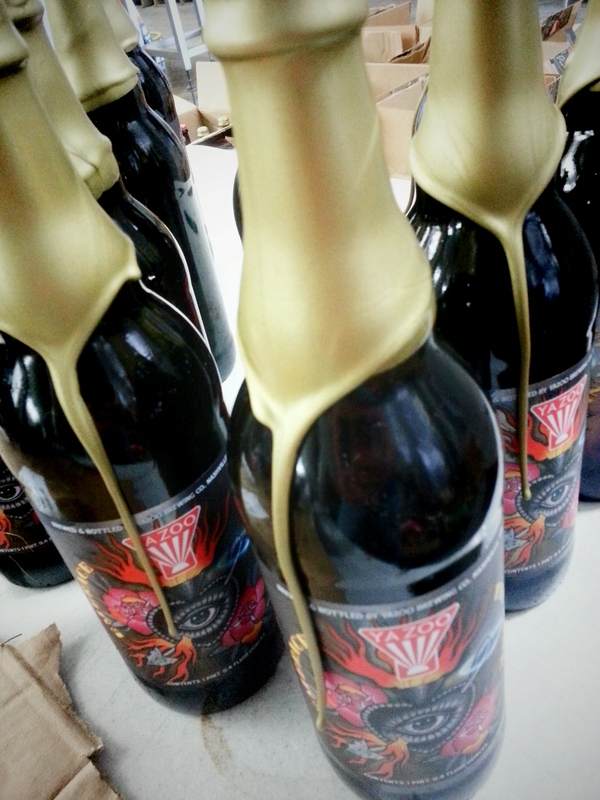 These 200 bottles will be available for sale to attendees of Funk Fest. It saw 3 months extra aging time in the barrel and really produced some nice character that is noticeably different from the original release. Cheers and I hope to see you soon!